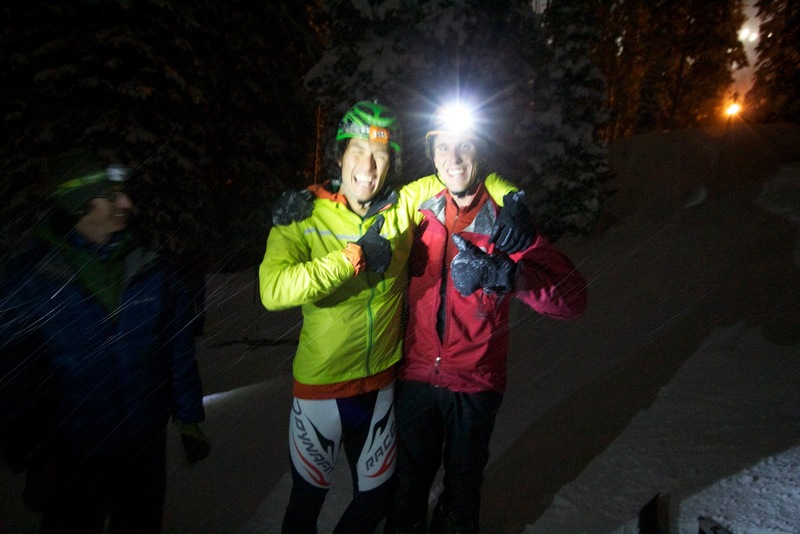 Last night we held the final race of our inaugural season of racing. Some 50ish hearty souls came out with enthusiasm to win the Sportiva skis and to once again get some exercise and ski by headlamp while the rest of America sat at home and watched something stupid like the Bachelor. The format was a two person team relay, with each person being required to complete two circuits on a figure of eight course (two climbs with shared descent). Each circuit seemed to take from 10 to 20 minutes depending on the person, gear, and motivation. Teams were decided by once again having the “fast folks” step forward and then having everyone on regular gear claim their partner. Once that was settled, we stepped forward to the straightest starting line of the year and then the drag race was off. The course began with a couple hundred meters of low angle cat track before tucking into the trees for steep technical skinning. With the pack strung out along the double track, Jason tried to drop the field but Jared hung on. My skins were starting to fail as were many others given the cold temps and the unsettled skinner. 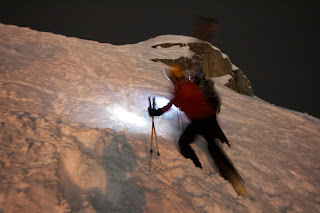 After the first descent, sneaky little Jared managed to jump into a second set of skis and was off before Jason and I had even skinned up one. Everyone was fighting their own battles though. I was chasing Jason and trying to avoid being caught by Teague. Teague was chasing me and trying not to get caught by Chad and Courtney. They in turn had their own pursuers. But the evening was determined by those on the heavy gear. My partner Jake was locked up in a contest with Teague’s partner, Blake. Those two guys went back and forth and both put in gutsy performances. In the end, Blake lost a skin and Jake took advantage, pulling away for the win. Psyched to beat Jared’s team. After the racing, we made our way to Molly Green’s for food, beverage, and prizes. 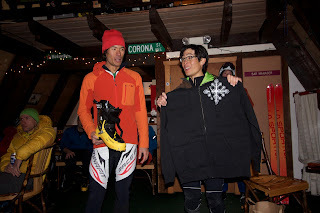 This time there was a bit more energy as everyone was anxious to win the Sportiva GTR skis, which were being raffled off as our Series grand prize. The customary pumpkin pies were given to Blake and Jake and then a couple more large pies were passed out to share amongst everyone for all being “winners”. 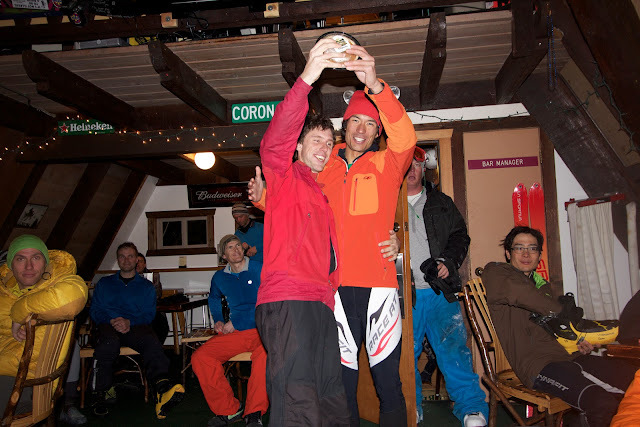 Then, for each of the nine races attended, people placed their names in the lucky boot and Jared drew the winners. Noah Howell of the Powder Whore Nation also kindly contributed some PW gear and movies, which we raffled off first (Surprisingly, Jared’s name didn’t come up every time). Then, a very befitting winner took home the new skis. Tim White has come to almost all of the races and has been an ardent supporter of the new series. So what started as a casual get together of friends on Thanksgiving morning has turned into a wonderful tradition of more friends, skiing, suffering, pies, and prizes. 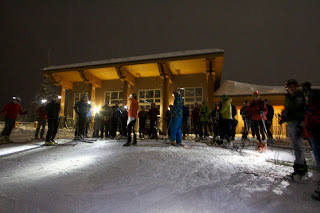 In all, we had 9 races this year, all of which where held in the Brighton Ski area and the surrounding backcountry. I estimate that over 80 people came out and participated in at least one race and many many folks raced multiple times. The format varied and we tried out a few different styles of races ranging from vert style (as many laps as one can do in an hour or two), team relay, hill climb, standard Skimo course, and a four lap short course. 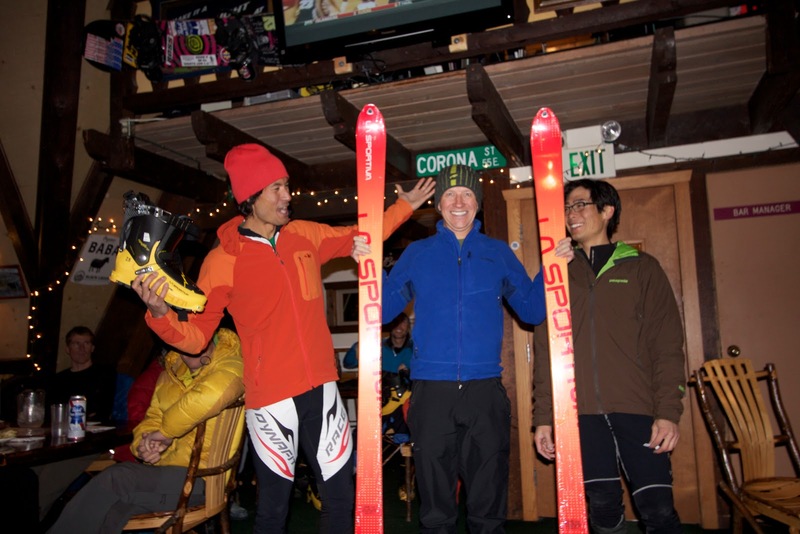 We had current and former US Skimo National Champions (both mens and womens), local hardmen such as Tom Diegle, weekend warriors, newcomers to the sport, people on carbon boots, tele boots, race skis, mega watts, and everything in between. Many companies rose up to show support including Kirkham’s, Minus 33, the Powderwhores, and main sponsor, La Sportiva. Brighton was a gracious host all series long and allowed us to use their terrain free of charge to pursue our shenanigans. Jared Winkler, Brandon Dodge, and Greg the cat driver all deserve special mention for giving the OK from an administration, patrol, and driver perspective. I think all four were accomplished and hope to grow the series next year and continue our relationship with the above mentioned great companies. Special thanks to La Sportiva for contributing the grand prize. And, special thanks to all of you who competed and made the series a success. Comments and suggestions on how to make things better are welcome.